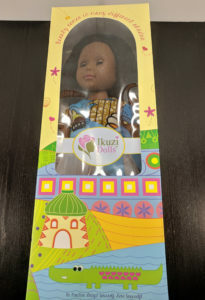 I should mention right away that I am not affilited with Ikuzi Dolls in any way, nor am I receiving any sort of compensation from them for this review or referral to their website. I had been eyeing the Ikuzi Dolls for over a year and with their Black Friday sale, I finally went ahead and purchased one. 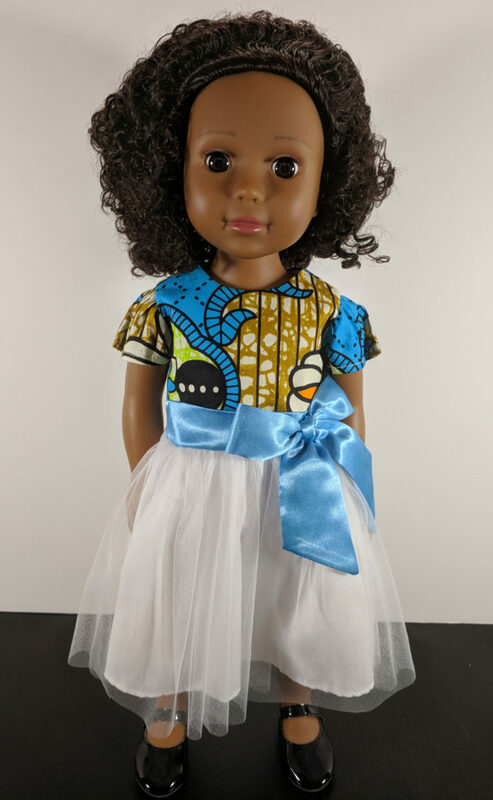 I opted for a medium skin doll with curly afro-style hair and a blue print dress. 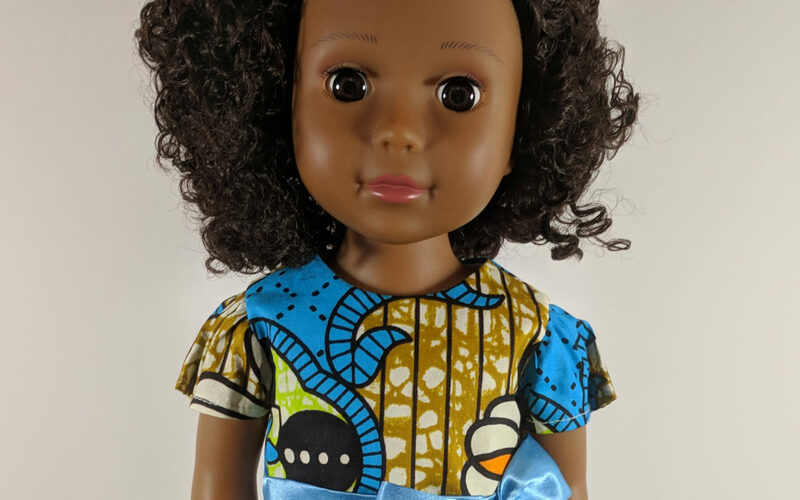 Ikuzi offers dolls with three different skin tones – light, medium and dark – as well as several different hair options that range from afro to long and wavy. Some of the dolls have brown hair and some have black. All of the dolls have beautiful brown eyes. They come in dresses that feature gorgeous African print bodices in a range of colours. At the time that I am writing this, they are retailing for $79.99 and are only available on the Ikuzi Dolls site. 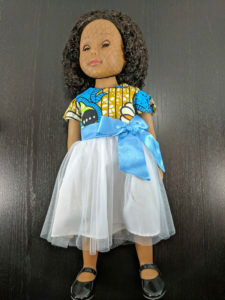 Ikuzi also sells doll clothing, doll hair accessories, African Fun Facts cards, bracelets for girls and a range of merchandise with the Ikuzi logo on it. 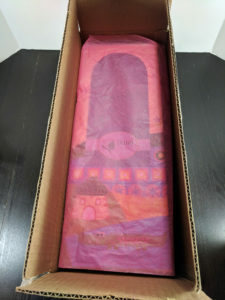 My doll arrived in a corrugated box with a sheet of tissue wrapped around her box. The doll box itself is absolutely delightful. 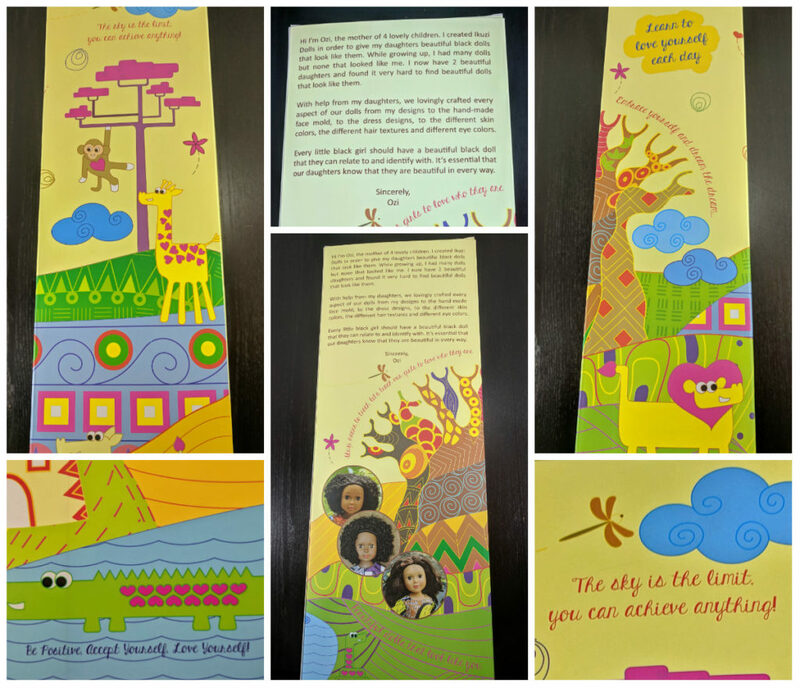 It’s very bright and colourful and has a number of positive messages for girls on all sides such as “The sky is the limit. You can achieve anything!” and “Embrace yourself and dream the dream…” It also includes Ozi’s story on the back of the box that explains why she created the dolls. My doll came with a hairnet to keep her hair tidy. And here we get to one of the things that I was absolutely thrilled about. She was not attached to the box in any way! 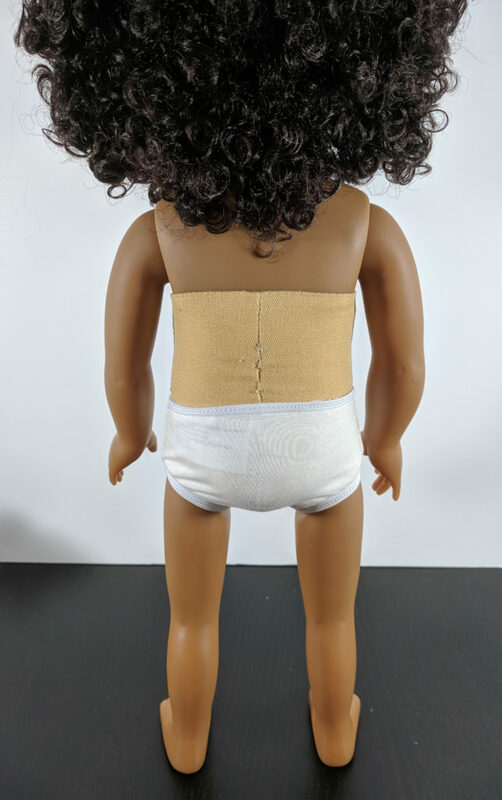 No elastics, no tape, no twist ties and especially none of those plastic tab things that end up sticking out of doll’s heads or ruining clothing. She just slid out of her box ready to go, apart from her hairnet. Her clothing is very well made The shoes are vinyl, topstitched, have a hard sole and a hook and loop closure on the side. The dress closure is also hook and loop. The bodice of the dress and the skirt are fully lined and all the seams are serged. There were no loose or unclipped threads (which is a pet peeve of mine!). 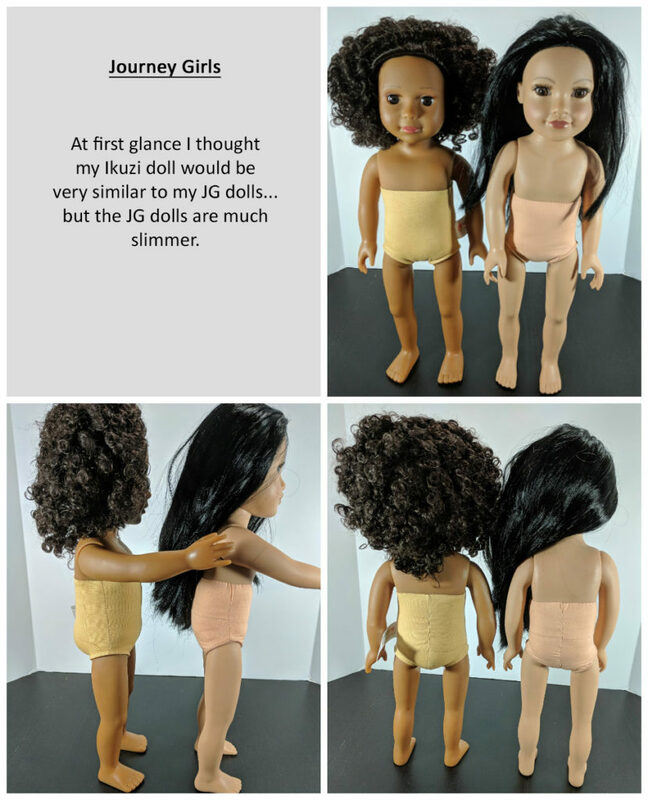 Ikuzi dolls have rooted hair. I’m not a huge fan of rooted hair generally but oh my gosh, I am in LOVE with this doll’s hair. It’s gorgous. It’s full, has a beautiful texture and is wonderfully soft. It’s one of my favourite things about her. My other two favourite things about her are her face sculpt and her chest plate. Her little face is absolutely adorable and a chest plate means she can wear strappy or strapless clothing items and look great. I really like the colour/tone of her vinyl as well. It’s very warm. Her vinyl itself however, is a bit disappointing. The quality is not great, even compared to the Journey Girls and Newberry Girls. My feeling is that this was a cost saving measure to keep the price of the dolls in a reasonable range. I imagine that it is very expensive to produce a small line of dolls, compared to the costs that large manufacturers/retailers pay. This is one of only two things that I disliked about the doll. The second was the lip paint. The colour is great but the way it was applied is not. I plan to repaint her lips in the future, so I’m not too bothered by it though. I feel that both these negatives are more than made up by all the positives that she has going for her! I also decided to compare her to some of my other dolls to see how easily they could share clothes and whether or not I could use her as a model for my patterns. See the chart at the end of this post for a detailed measurement comparison. I compared her first to one of my Journey Girls dolls since they both have chest plates. My Ikuzi doll does have skinnier legs like the Journey Girls but she is actually quite a bit bigger than them in the body. Her feet are also shorter and fatter than the long skinny feet of the Journey Girls. When I tried her dress on Callie (the JG), it was way too big for her. Surprisingly, her shoes fit Callie the best out of the three doll types I compared her to. Callie’s feet fit in them and I was able to do them up properly. Next I compared her to my Newberry doll Addison (Addie). 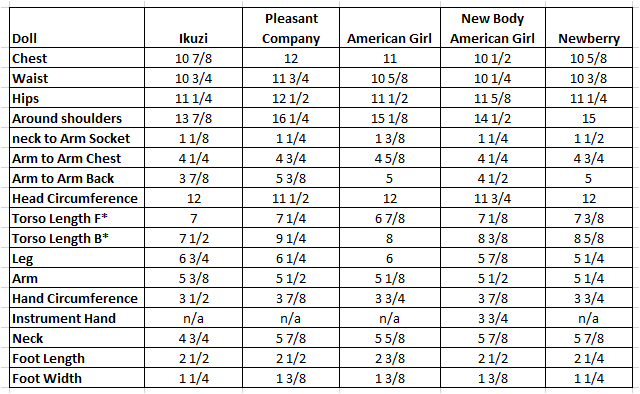 In terms of body measurements, I felt she was most like Addie, although Addie’s legs are definitely shorter and thicker. Their arms are roughly the same length but Addie’s are thicker. Addie’s torso is a bit longer as well but girth-wise, they matched up the closest. Addie could wear the Ikuzi dress without any problems but the shoes were a different story. I could get the Ikuzi shoes on Addie’s feet and although I could fasten the closure, I couldn’t fasten it properly. Lastly I compared her to my biggest and my smallest American Girl dolls. Sam is my chubbiest doll – he was made from a Pleasant Company Samantha. Marie-Grace is my slimmest AG doll – even slimmer than Logan. My Ikuzi doll was smaller than MG, but the differences were not huge. I feel she can comfortably model patterns intended to fit AG dolls without major modifications in most cases. There were three main differences that could cause some fit issues. The first is that the Ikuzi doll’s shoulders are much narrower than the AG dolls’ shoulders. They look like linebackers compared to her. The second is that her legs and arms are quite a bit slimmer than the AG dolls. Lastly, her feet are definitely more narrow than AG feet. I tried her dress on my middle-of-the-road AG doll – Jennifer, who is a JLY 39. I could get the dress on and even close it but it pulled a lot in the shoulders. I could get the Ikuzi shoes on her feet and close them – barely – but they were not fastened properly. Overall, I am extremely happy with my Ikuzi Doll and I’m glad that I finally purchased one! She’s going to be a cover model on an upcoming pattern that will be released in the next day or so. I would definitely recommend this doll to anyone that is looking for a beautiful doll of colour. Now she needs a name! I haven’t been able to find one that fits so far. I’d love to here your suggestions so leave them in the comments. Oh and here is the detailed measurement chart for you. The measurements listed are in inches. 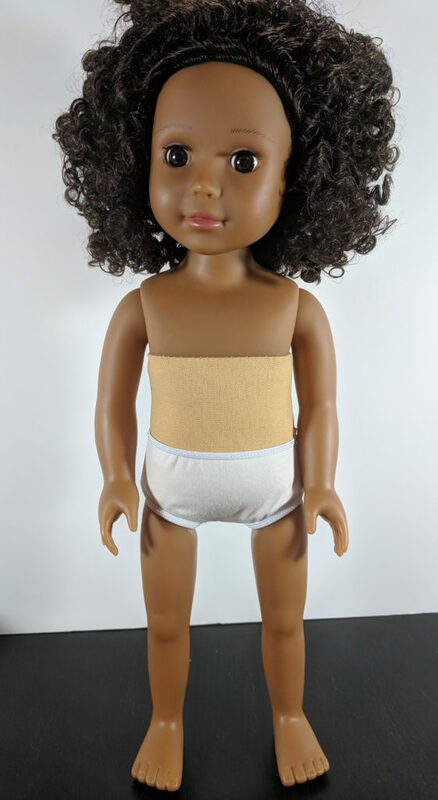 “American Girl” refers to the older, thicker style cloth body and “New Body American Girl” refers to the newer dolls with the thinner cloth bodies (such as Logan, Tenney etc.). *Torso Length is from neck to crotch seam. loved reading this review… off to look at the website now. Please let us know if you end up bringing one of these beauties home! You’re welcome. 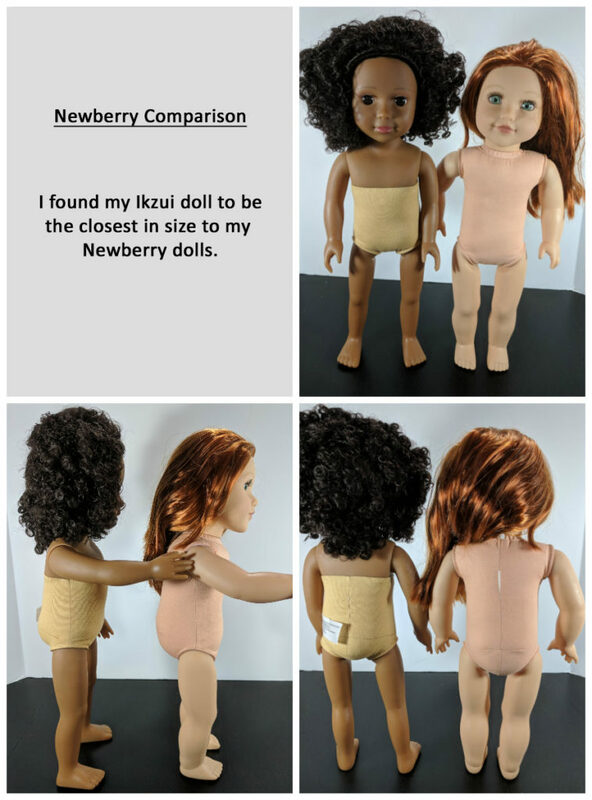 I want to get the word out about these dolls. They are so pretty and the lady that started the company is great to deal with. I can tell that she has a lot of passion for this. pronounced with a silent E, the y like an e, with a soft a. This is a beautiful name, I met a young lady with this name and looked it up. The essence of the given name Enyka stands for understanding, imagination, cooperation, artistic talent, tact and patience. That is a beautiful name and one I’ve never heard before! Thank you for the suggestion. Thank you for taking the time to evaluate all the differences and then share your review. You’re very welcome! I’m glad you enjoyed the review.